What makes a tumor therapy successful? Innovative high-precision technology combined with a dedicated and experienced team. For more than 10 years we have been specialists for the radiosurgical treatment using ultramodern CyberKnife and GammaKnife systems. Numerous tumor types and functional disorders in almost any body area can be treated with maximum efficiency thanks to our accurate irradiation system. Thereby, the healthy organs are only minimally affected. Meanwhile, many types of tumors can be treated with the CyberKnife and Gamma Knife technologies as sustainably as with a surgery, but with one decisive advantage: the patient can be released into his/her everyday life directly after the therapy. Often there is just one painless outpatient treatment required. Furthermore, all those long-winded and costly rehabilitation processes can be avoided as well as losses of working hours being connected with them. 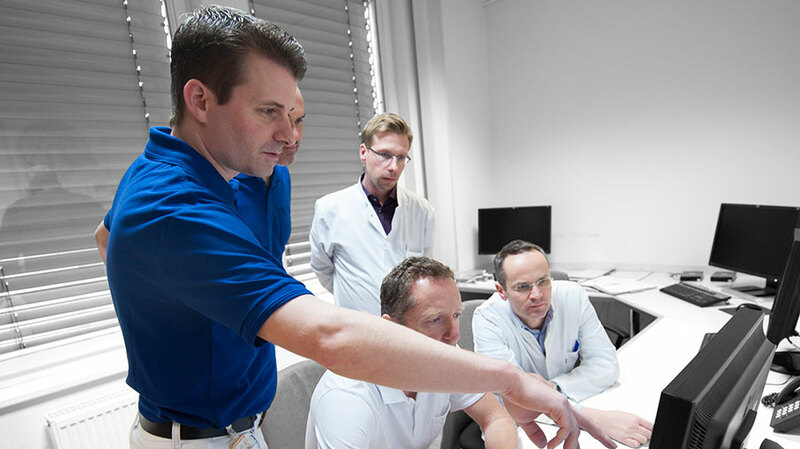 In our SAPHIR competence centers in Northern Germany and Frankfurt am Main we offer our patients high technical precision, extensive and long-standing experience as well as an optimal and integrated care through multiple university cooperation. We accompany you starting from your initial consultation through the treatment optimally tailor-made to your case’s requirements up to the aftercare procedure. You will be supported by our experienced team of neurosurgeons, radiation oncologists, medical physicists and medical-technical radiology assistants (MTRA). Radiosurgery is a non-invasive method for a targeted treating of tumours and functional disorders. Its positive impact has been verified in numerous clinical and retrospective studies. The SAPHIR team and cooperation partners have always been and still are decisively involved in the development of this high-precision technology. The high precision of the systems applied (e.g. CybeKnife) minimizes the radiation exposure significantly. The healthy organs are only negligibly affected. The accuracy and the effectiveness of the treatment with minimal side effects are proven by multiple technical and clinical studies. Once the outpatient treatment has been completed, you can return to your normal daily life. The treatment duration is significantly shorter than with other methods (1 – 5 sessions). A faster recovery and reintegration into your everyday life is almost always possible immediately after the treatment.